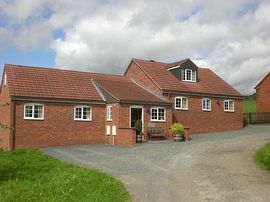 The Old Kennels Farm Holiday Cottages are situated in lovely east Herefordshire,bordering Worcestershire and Gloucestershire.There are hills and woods to the rear of the farm providing idea walking country and the Malvern Hills are only 6 miles away. 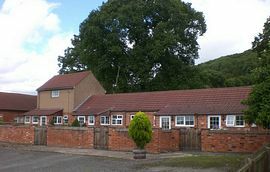 The holiday cottages are conversions of old farm buildings and are all named after old varieties of cider apples. Sweet Coppin cottage sleeps 6 people in total, with two spacious bathrooms. Open plan dining/ living area and a fully equipt kitchen. Tom Putt cottage sleeps 6. Very spacious cottage with lots of pine throughout. Well equipped kitchen with a dishwasher. fridge freezer etc. Dinning area, lounge area with door leading to a private patio. Also on the ground floor are 2 twin bedrooms and a bathroom with a shower. Stairs leading to a double bedroom and a further bathroom with a bath. Large porch area with seating. No pets. Yarlington Mill Cottage sleeps 3. Open plan kitchen, living and dining area. Stairs leading to a shower room, a double bedroom, and a single bedroom. This cottage also has a large porch area with seating and a pretty walled courtyard with a picnic bench. Pets are welcome. Bedroom with twin beds and a very large shower room. The cottage also has a porch area with seating and a pretty walled courtyard with a picnic bench. Pets are welcome. Slack-Ma-Girdle First floor apartment sleeping 2. Stairs leading from patio area to open plan kitchen, dining and living area. Double bedroom with en-suite bathroom with bath. Brown Snout Cottage End cottage sleeping 2. Double bedroom and en-suite shower room. Front porch area with seating. Pretty walled courtyard with picnic bench. Pets are welcome. Porch at the front of the cottage, patio at the back. Local Services: Mainline train line only a 5 minute walk away. Trains to Birmigham and london. 10 minute walk into Ledbury town centre. Once in ledbury follow the main highstreet towards the train station. Follow the road under the metal bridge and take the first drive on the right. We are open all year round, week bookings stretch from Saturday to Saturday, short breaks welcome at late notice.